Google Translate has an iOS and Android app that you can download and use on your smartphone or tablet. Both versions of the apps do the same things, with a few minor user interface differences that depend on the operating system you’re using. The app can stay synchronized with Google Translate on your computer, but that doesn’t mean you can’t use the mobile app by itself. Google Translate has a pretty good reputation for accuracy, but it’s far from perfect. It can make mistakes. This may be fine for casual use — such as when you’re traveling and you need a quick translation of “Where’s the bathroom?” But if you’re on official business, you’ll need to be careful. At the top of the screen, choose the language you’re going to translate from. The language you’re using natively on your device should be the default. Then choose the language you want to translate into from the drop-down menu. On the onscreen keyboard, type in the word or phrase you want to translate, and then tap the blue circle with the arrow. The translation appears in the blue box below (see Figure 1). Figure 1: Translating on your smartphone. Take a photo: You can take a photo of something like a sign or a restaurant menu that is in another language. 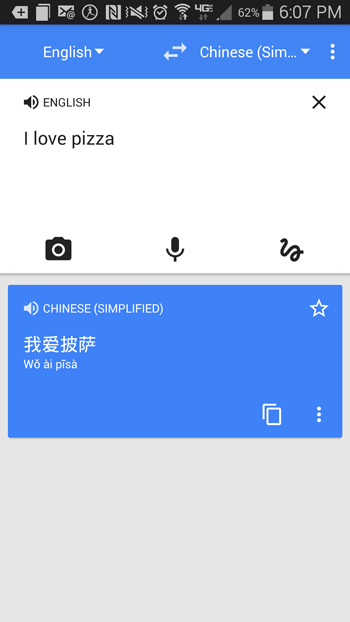 Google Translate can recognize the foreign words and translate them for you. Just tap the Camera icon; your device’s camera scans the object, and Google Translate looks for words it recognizes. You can then select the parts you want translated. Speak: Tap the Microphone icon and speak into your device’s microphone. Google’s voice recognition records what you say, and then almost instantly provides a spoken translation. Handwriting: Tap the squiggly line icon to write what you want to translate. Google’s handwriting recognition is pretty good, but it’s likely you can type or speak faster than you can write, so you may not find this option as useful.